A coalition of environmental groups including Kentucky Waterways Alliance has sued the Interior Department and U.S. Environmental Protection Agency, seeking to overturn a new rule that will make it easier for mining companies to dump waste rock into streams. The revisions, made final Dec. 12, will let mining companies disregard a 100-foot stream buffer zone if they are able to convince regulators that no other option was available and that they had taken steps to minimize harm to the environment. Attorneys with Earthjustice, Appalachian Center for the Economy and the Environment, Appalachian Citizens Law Center, Sierra Club and Waterkeeper Alliance filed the legal challenge yesterday in U.S. District Court in Washington, D.C. The suit was filed on behalf of the Kentucky environmental group as well as the Southern Appalachian Mountain Stewards, Save Our Cumberland Mountains, West Virginia Highlands Conservancy, Coal River Mountain Watch and Ohio Valley Environmental Coalition. If not overturned, the environmental groups from Kentucky, West Virginia or Tennessee said the rule change would lead to more mountaintop removal coal mining. That’s the mining practice of using explosives on the tops and sides of mountains to get at underlying coal seams. “The notion that coal mining companies can dump their wastes in streams without degrading them is a fantasy that the Bush administration is now trying to write into law,” said Judith Petersen, executive director of Kentucky Waterways Alliance. Specifically, the lawsuit alleges that the federal agencies violated environmental protection standards, failed to consider the cumulative effects of stream loss from mining, and failed to analyze a full range of alternatives, among other allegations. Gov. Steve Beshear along with Attorney General Jack Conway and U.S. Reps. Ben Chandler and John Yarmuth wrote letters to the EPA opposing the rule change. But 20 Kentucky legislators, including House Speaker Jody Richards and House Majority Floor Leader Rocky Adkins, followed up with their own letter supporting the change. We expect the story to get a fair amount of national coverage as well, beginning with this Associated Press piece on the lawsuit. In other environmental news, yesterday the EPA designated five counties within the Louisville region, as well as some other counties within Kentucky, as non-compliant with federal clean air standards regarding particulates. Fun. Well, Sunday’s meeting in Otter Creek Park was at least a success in terms of both turnout and media coverage, but the park is still closing January 1st, with an uncertain future beyond that date. An estimated 475 signatures were signed for a statement drafted by Jason Flickner of Kentucky Waterways Alliance that urges Mayor Jerry Abramson to work as diligently as possible, especially with other interested local, state and federal government agencies or other groups, to keep the park open. It may be the last campfire the Bryant family ever builds in Otter Creek Park. For 30 years, Jimmy Bryant has been bringing his family to this park. It’s a tradition that’s about to end. His daughter Brandi Cruse remembers all of the campfires she used to sit around here as a child and says she wants her three year old daughter Aya to have the same memories and experiences, but now she won’t. It’s a thought that brings Brandi to tears. Thousands of other people have built memories in Otter Creek Park as well — hiking on the miles of trails, biking through the woods, and seeing wildlife at almost every turn. Bill Butler has been coming here every week since he was 13 years old. He says the thought of not being able to come to this park anymore keeps him up at night. The city of Louisville has owned and operated the 2600 acre park since 1949. The problem is, it costs about [$500,000] a year to keep this park open, and right now the city of Louisville just doesn’t have that money. So on Sunday, about 250 people got together in the park to hold a rally to try and convince the city of Louisville to keep Otter Creek open. They made signs, handed out flyers and signed petitions. The group hopes it will continue to come to the park for many years to come. Right now, Otter Creek Park is scheduled to close on January 1st. Of course, that news story doesn’t tell the whole story. As noted above, 475 signatures were collected, conflicting with the report of 250 people. That said, even if there were only 250 people (we didn’t count), that’s still pretty decent considering it was a pretty cold afternoon. Additionally, that story (and others like it) don’t really tell much about who showed up. We saw a diverse crowd of people and interests: campers, fishers, mountain bikers; people from Louisville (East Enders, Southwest Louisvillians, Highlanders, etc. ), Hardin Countians, Meade Countians, OCP employees. And a few Camp Piomingo alumni (like us!). All of us had many reasons to be there, but all agreed on one thing: closing the park will be a huge blow not only to Louisville, but to the surrounding region as well. After the rally dispersed, we went walking around the Van Buren and North Point areas of the park, and took a few pictures (we didn’t take any at the rally). You can see them on our Flickr page here. WHAS-11 News is reporting that Louisville Metro has extended the closing date of Otter Creek Park from December 14th to January 1st. A large turnout is expected at Otter Creek on Sunday, December 7th when a group trying to save the park will meet at the park pavilion to discuss their options. The meeting starts at 2 p.m. Unfortunately we’ll be able to attend but we hope it goes well! If you attend, please be sure to tell us how it went. 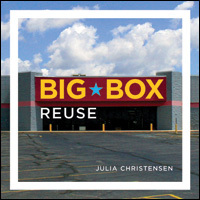 In her book Big Box Reuse , and accompanying photographic exhibition, Julia Christensen takes us on a road trip across America to look at what becomes of the spaces superstores leave behind when they move out. These warehouse-like buildings have found their place in the built landscape since the first Wal-Mart, Kmart and Target stores opened in 1962. Since the spring of 2004, Christensen has driven over 75,000 miles, visiting converted “big boxes” and meeting the people who are transforming these massive shells into useful structures for their community. She has documented what happened to the structures, the parking lots, and the surrounding communities. She has found out who wanted to reuse the buildings, why and how. What Christensen has discovered is that examining the big box building provides a wealth of information that will help us steer the future of our landscape with more informed decision-making processes. Among the things Big Box Reuse points out: despite the harmful construction of the big box, reuse is a powerful tool in the fight against the increasing dangers of sprawl. For every building that is reused, a new one does not go up; a monumental victory, as the National Trust for Historic Preservation recently indicated the energy used to destroy older buildings in addition to the energy used to build new ones could power the entire state of California for 10 years (LA Times, October 2008). She’ll also be speaking and signing books tomorrow (that’s Thursday, December 4th) at the Glassworks Building at 6 PM as part of the Sustainable City Series. This event is free but space is limited; you can reserve a space here. Last but not least, Julia will be in Bardstown on Saturday, December 6th for a book signing at Bardstown Booksellers starting at 2 PM. For more information, visit the Big Box Reuse site at http://www.bigboxreuse.com/book.